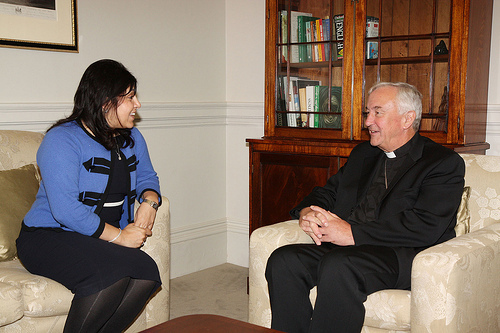 Baroness Warsi yesterday met with the Archbishop of Westminster, the Most Reverend Vincent Nichols, for the first time since she became Minister for Faith and Communities. The Archbishop, who is President of the Bishops’ Conference of England and Wales discussed with Baroness Warsi the central role faith plays within communities and in building a cohesive society. Baroness Warsi is also Senior Minister of State at the Foreign and Commonwealth Office, where her responsibilities include human rights and religious freedom, and is holding a series of meetings with faith leaders during her first few weeks in post. They discussed building upon the achievements of February’s visit to the Vatican, during which Baroness Warsi led the UK’s largest ever ministerial delegation to the Holy See alongside the Archbishop of Westminster. ← Independent: From free school meals to the foreign office: the next generation of mandarins?